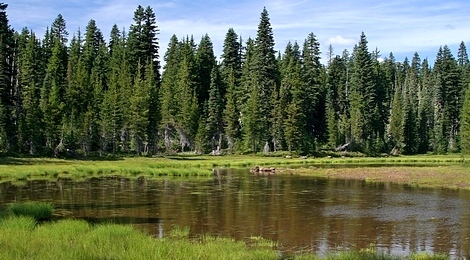 Here is a fun little hike loaded with natural beauty as well as native history. The Indian Race Track hike begins off Forest Road 6048 near the summit of Red Mountain just outside of the Indian Heaven Wilderness. 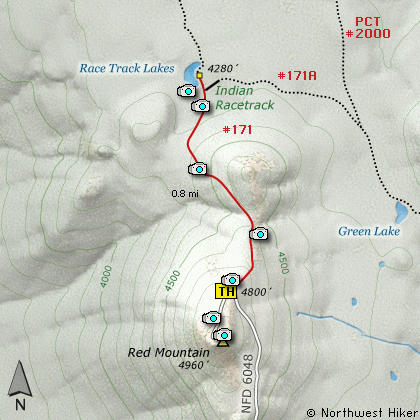 The hike begins on the side of a mountain therefore the trail loses elevation immediately. During the first part of the hike you will be in and out of the forest therefore you get incredible views of the surrounding terrain, including Mt Adams to the northeast. In about a half mile the trail descends into a heavily forested area and remains that way until you reach the meadow named - Indian Racetrack. It is my understanding that this meadow was used by the native American peoples for get togethers during the summer and fall food gathering months. I have read that this area is referred to as a racetrack because the people could safely race on horseback. Continue north on the Wind River Highway for about 5.8 miles to the junction of the Wind River Hwy and the Old State cutoff road east. In just a few hundred feet turn left, north, onto Forest Road 65. In another 4.7 miles you will pass Forest Road 68. Continue north on FR65 for another 6.1 miles and you will come to the intersection of Forest Road 60. Bear right onto FR60 and head east for 1.5 miles to the junction of Forest Road 6048. Bear left onto FR6048 and follow this rough steep road another 2.8 miles to the parking area and trailhead to this hike.